Gradient: 41 fpm average. 68 fpm from put-in through Squaw Leap Falls. 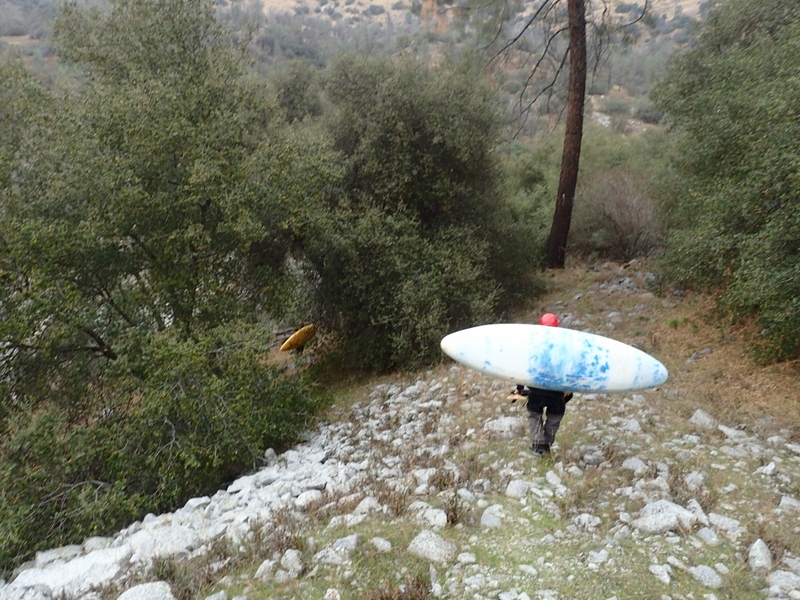 I was in town for business… it has been 3 years since I last got a new personal first descent in California. They are hard to come by while living in Tennessee! So the week before my business trip I see the message boards call out that the San Joaquin was releasing… as I don’t bother looking at dreamflows these days while living in the South East, I was pleasantly surprised. Fingers crossed it would hold out until the following weekend! As the weekend came around, flows had indeed held. So after my last meeting on Friday, I left Sacramento to drive south, with the plan to meet Jeff in Modesto so we could carpool from there. When we arrived however, the weekend plans were ruined by the gauge updating to now read 500 cfs… much too low. With disappointment on our mind, we turned around and headed to Sacramento to crash at Jeff’s house and do Chili Bar the next day. That is… until I got a text at 7:30 am stating that it was back up! So, the plan was laid… head back down. We would arrive too late to do the whole Patterson Bend Saturday since we didn’t anticipate getting to take-out until 12:30… so we planned to do Squaw Leap that afternoon. That would get us on the water, and allow us to make even better time on Sunday when we planned to do the whole section of river. Squaw Leap can be considered part of Patterson Bend, however due to a discharge of water just above Kirchoff PH#1, this section actually runs much more frequently than the upriver Patterson Bend. Because of that, it is considered separate. However, if you are running Patterson Bend… then you are almost certainly also running Squaw Leap. The run started off a bit iffy. 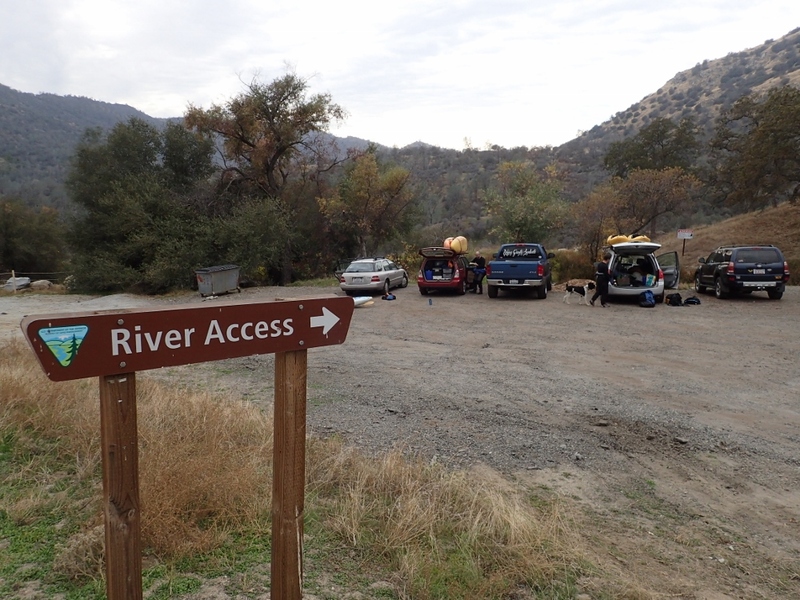 We drove down to the river to the upstream side of the powerhouse. You can hike in a ways to the downstream side. 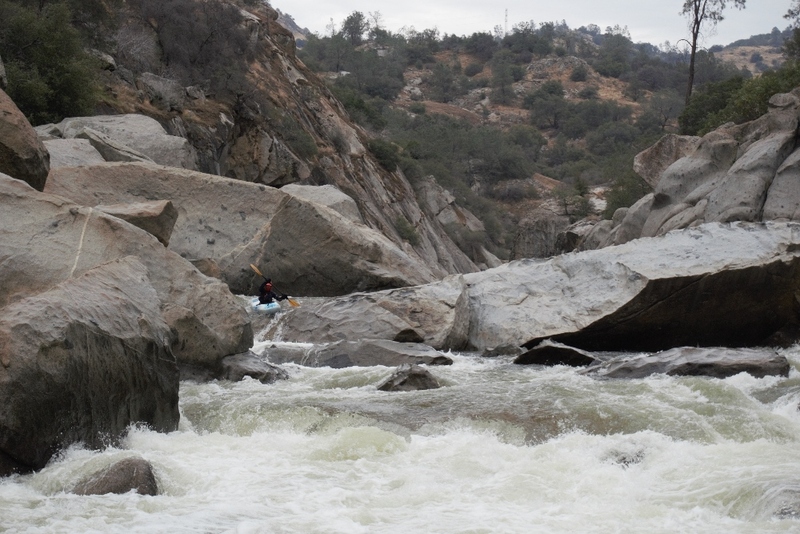 Both involve scrambling, but the downstream side is cleaner. As it turs out I had some ground slip out from under me and I fell/slide/bounced/tumbled/crashed down a 20-25 foot tall cliff. 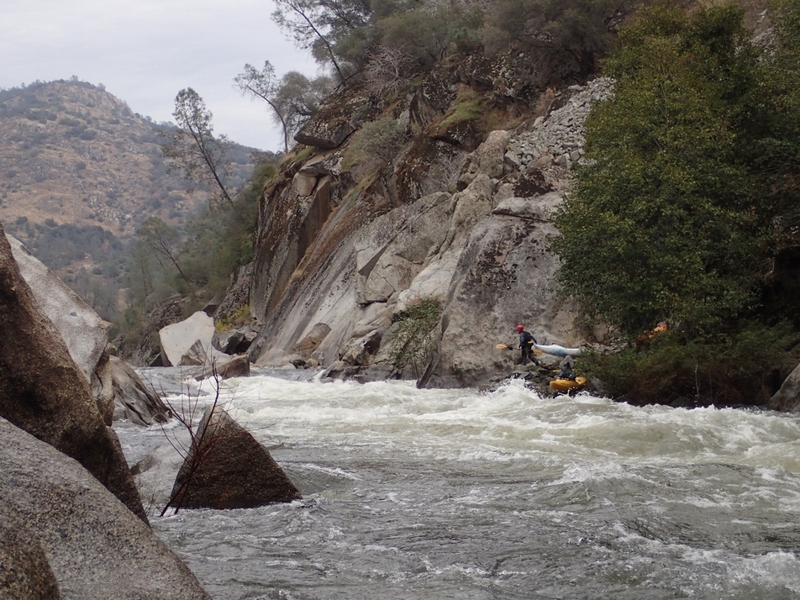 Luckily as I took one final big bounce I ended up landing on top of my boat rather than rock at the bottom. Somehow I walked away unscathed. Putting on the river you are greeted with one class III- rapid before you get to it and see your first horizon line. I was able to scout on the right with some effort. At high flow it would have been much harder. 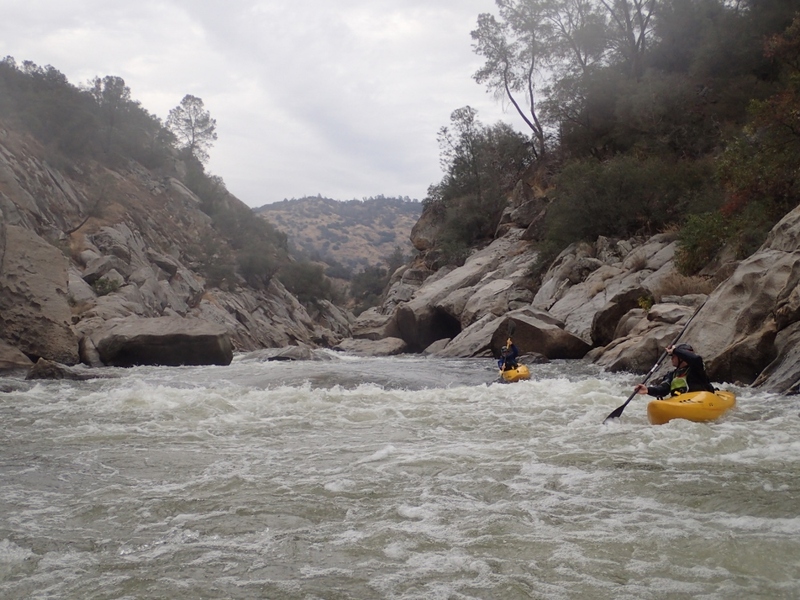 Shortly downstream you get to another horizon that we boat scouted. Then, very quickly you find yourself at the Squaw Leap rapids #1 and #2. At low flows #1 felt class IV+ and #2 felt V-. However returning the second day the water spiked on us hard and we found both to be V… with the #1 being stouter than #2. One in our group got stuck in the entry hole on the right and was body recirculated for the better part of a minute. It was very nerve racking. Somehow for #2, at the lower water the hole at the bottom which swam a group member on day 1 flushed out in day 2. So the harder part was the top move of that rapid. 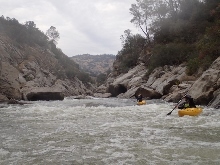 Though some of us opted to portage the entrance and do a hairy ferry to the left through the middle of the rapid. 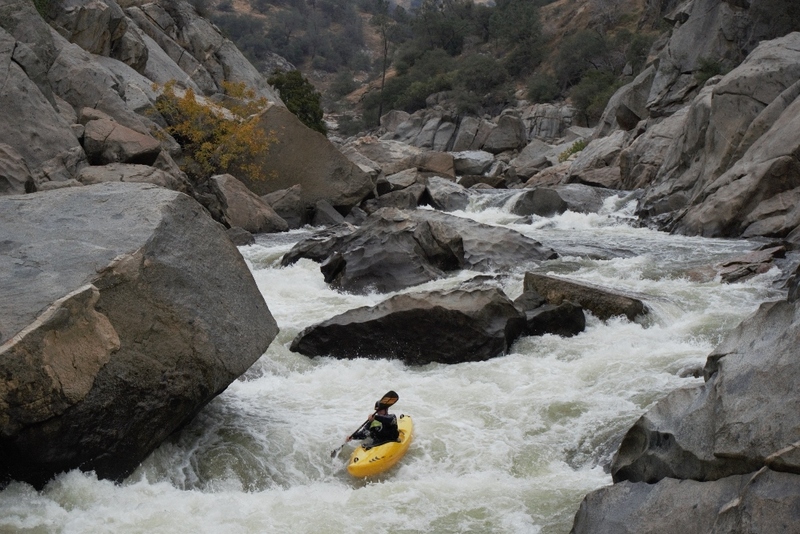 Downstream the river quickly reduces difficulty to class III to IV and you enjoy pleasant scenery down to take-out. 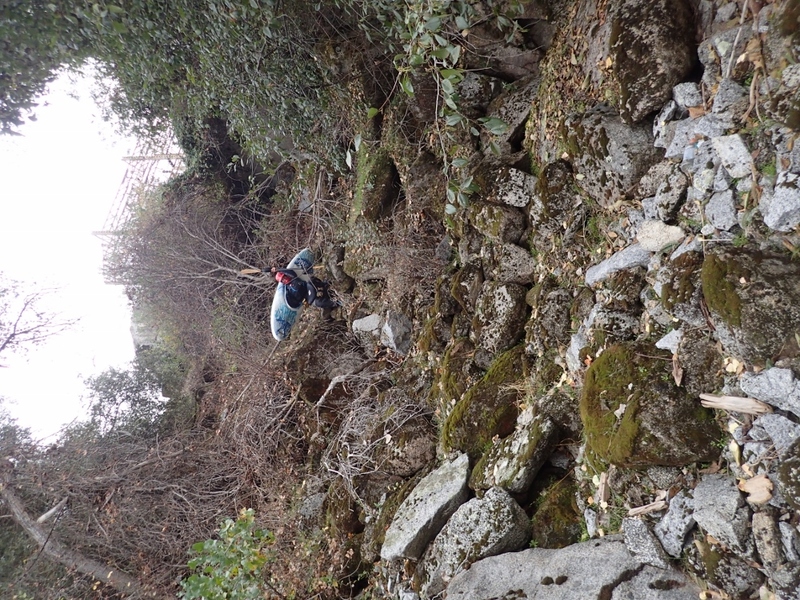 We used the trail to hike out, the AW write-up says it is very steep and makes it sound horrible. It gains maybe 200-300 feet of elevation 1/3rd of a mile or so. I would say it is half as much as the Burnt Ranch Gorge hike out. Overall, it wasn’t a bad hike. I think this run would be great to be local for… you could churn out laps on it and earn it via the hike out and the scramble in. However, it is short. I wouldn’t really want to travel here just for the Squaw Leap section as it is far from anywhere but Fresno, few other nearby runs would be running at the same time, and it is just so short. However it does make a great run to get an intro into the Patterson Bend. 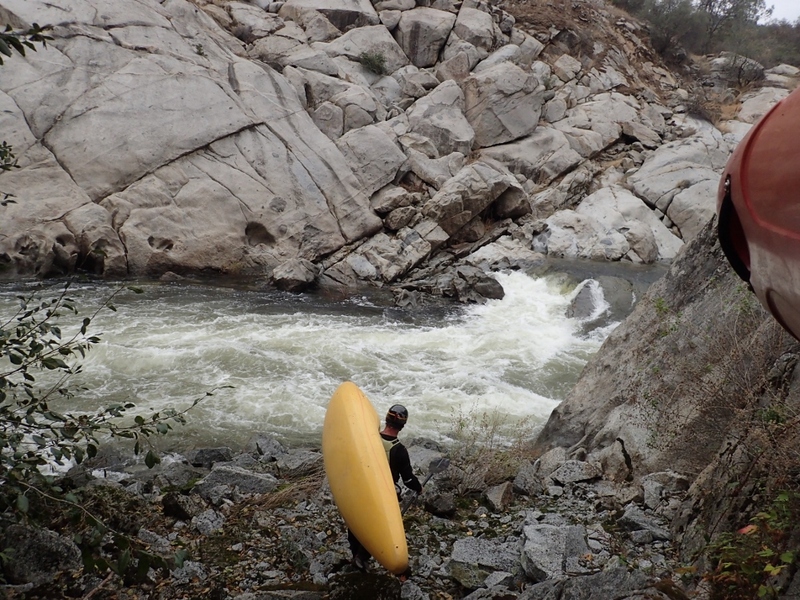 Both of the runs have rapids that are very difficult to portage. 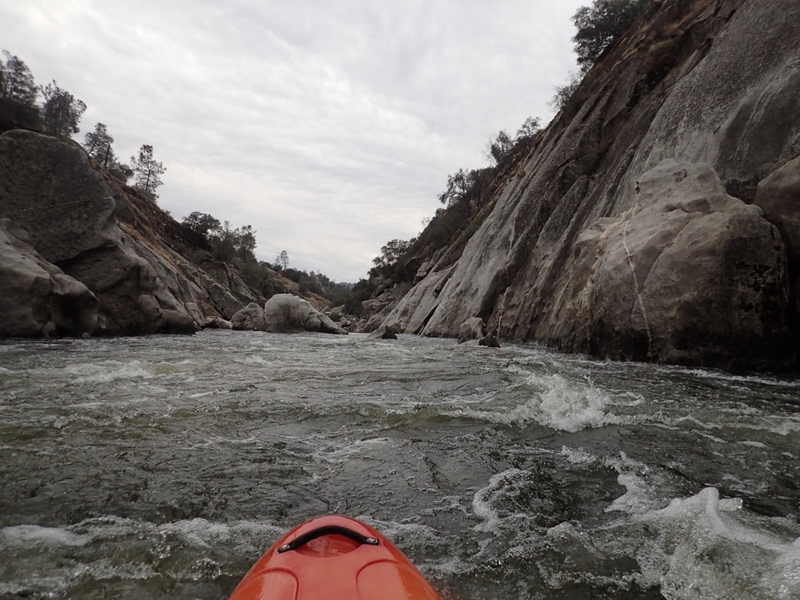 If you can handle Squaw Leap, you can also probably handle Patterson Bend, though none of the rapids are as tough as Binocular on Patterson Bend. 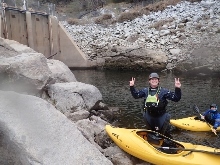 But, if you find yourself not liking the limited portage options on Squaw Leap than it would be a good indicator that Patterson Bend is not for you. 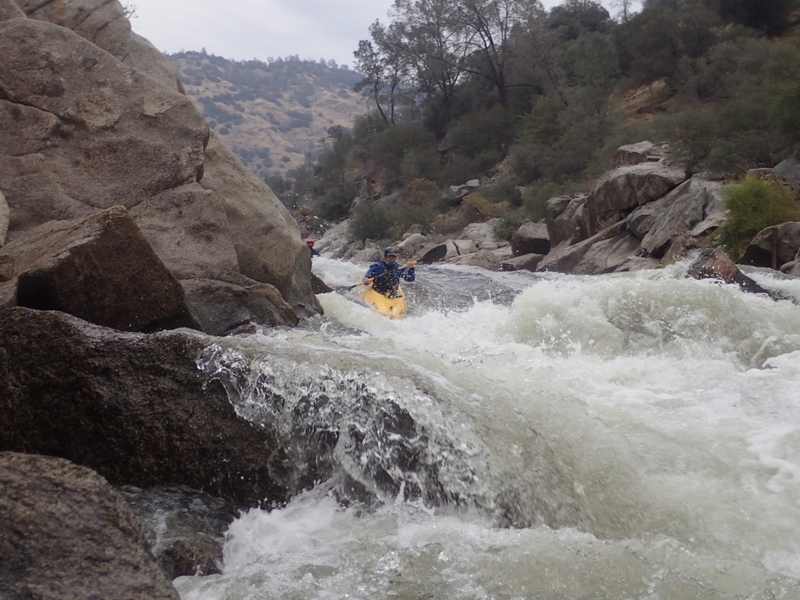 In conclusion, the first day we had ~2000 cfs. 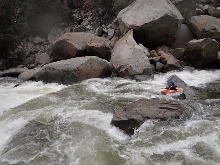 This flow felt idea for a first time as we could scout and break things up. 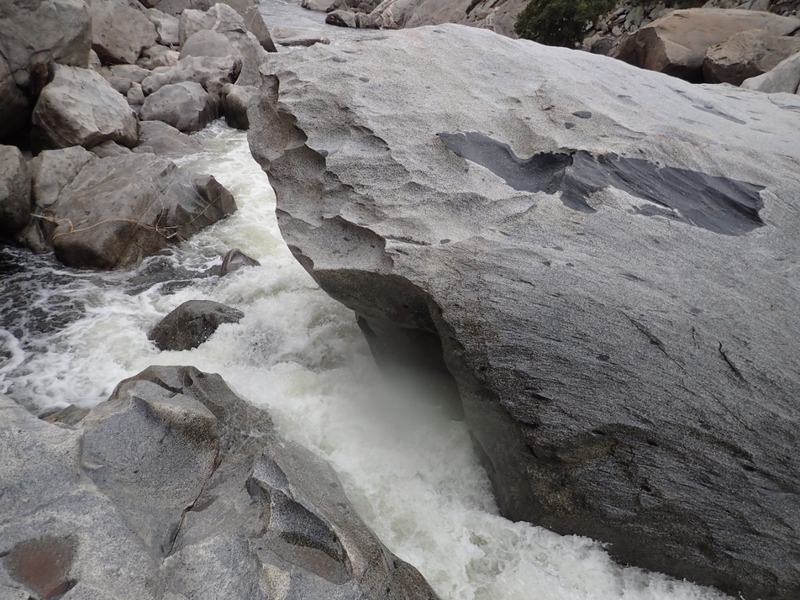 The second day we had somewhere around 3,000 cfs (gauge went down) and we found this flow to be juicy. It still went for sure, but the river got significantly harder. 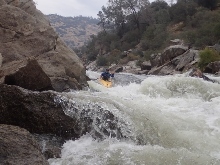 No longer class IV+ and for sure class V. I say this because in the short section there are really only 5 rapids that are harder than boogie. And the two Squaw Leap rapids offer limited portaging (not without significant effort… though I really don’t think you could portage the bottom half of #2) which therefore dictate the difficulty of the run in my mind. But yea, I thought it was great fun. Unique and distinct moves in a super cool granite canyon that does not seem in place in the foothills. I think flows around 1,800-2,100 would be ideal for a IV+ experience. That seems like a lot of water but the rapids are formed where rock-fall has dropped in… so in the main rapids the volume of water that isn’t underground is substantially less. 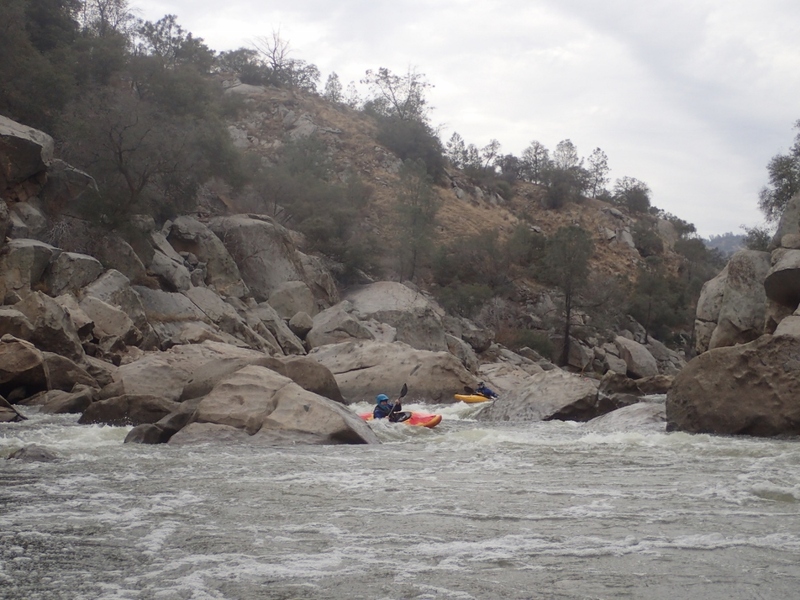 The biggest rapids felt more like 1,000 on 49 to B then the 2,000 cfs we had. I guess that also makes it obvious that swimming should be avoided! First Rapid (II+). The first rapid is a simple wave train. At higher flow it basically led directly to the Second Rapid. Second Rapid (IV to IV+). At lower flow it was much mellower. There is a slide right of center. Too far left lands you in a hole (or smashing rocks if you are center or further left), and too far right hip checks a rock and deflects your bow left… which ends you in the middle hole. The lip moves right so aim right of center and keep your bow right. Third Rapid (IV to IV+). At low flow this one was harder. It is a small step to a boof over a meaty hole. A few in our group got eddied out on the right at the base. I could see this one handing out beatings. At higher flow it was a ramp into a smaller hole that was easy to punch. Squaw Leap #1 (IV+ to V). At low flow we were able to scout on the left easily. 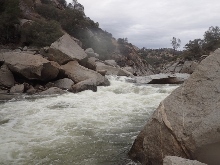 The river splits around a 30 foot wide and relatively flat rock. River left has a rock blocking the channel. River right has a narrow chute that you want to exit left over a 6-8 foot ledge. Then work center/right to boof the exit holes. 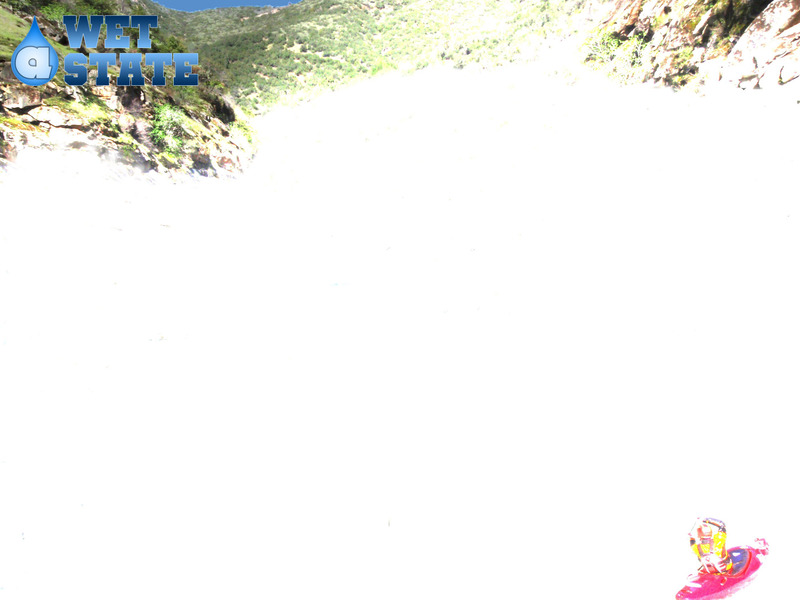 At high flow the exit of the Chute at the top of the rapid was meaty ad dangerous. You for sure want to boof it! You can also scout on the right. 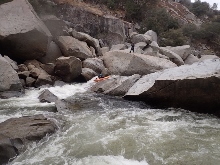 At low flow I thought the rapid was IV+ and at high flow it was the hardest on the run, V for sure. Squaw Leap #2 (V- to V). At low flow there was a lot of time to make the moves, but the exit hole was big. At high flow there was no time to make moves but the exit was friendlier. Hard to say which is harder. At our lower flow we boofed the main channel on the right at the top. 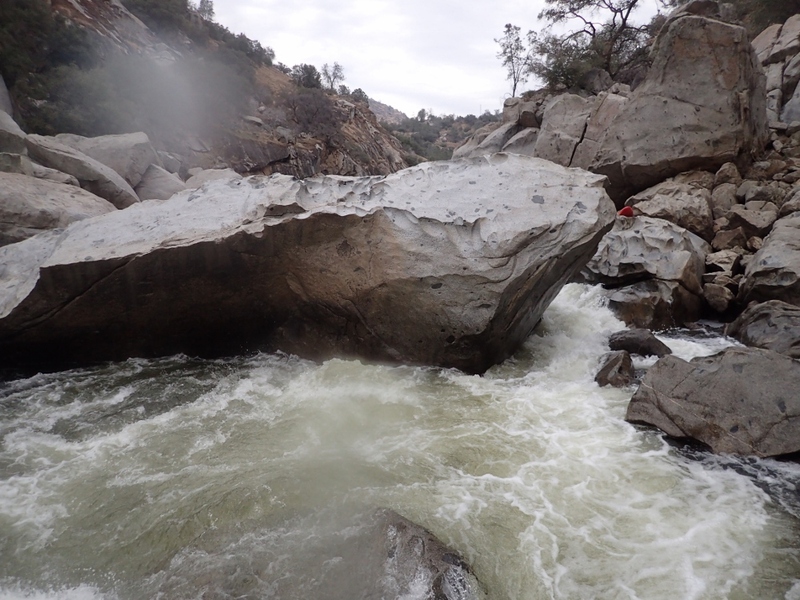 With a little more water you can boof the middle rock. And at higher flows you want to run far right on the cushion or far left against the wall. At the bottom, stay far left through the sequence. At low flow it was a ramp over a hole, a boof over a small ledge, and then you wanted to drive far left through the edge of a large hole that swam one of our group. At high flow the exit was just crashing waves and the exit hole washed out. 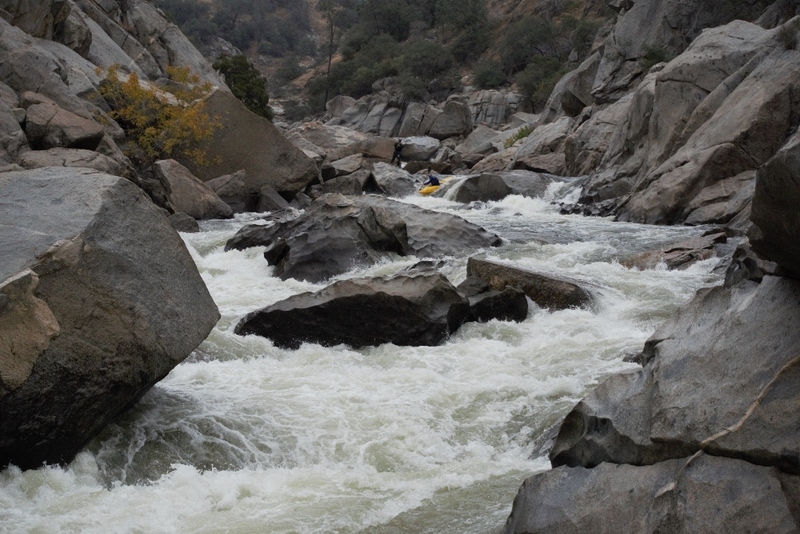 Fifth Rapid (III- to III). At lower flow this one was a smidge harder as you needed to swing wider around the center hole before cutting back left behind it. At higher flow you just went straight and cut left. Sixth Rapid (IV). But this rapid has a steep ramp that looks frightening from above. But as you crest the lip you can see a ramp on the far right which leads you down and around the hole in the center of the river. Eighth Rapid (III to IV). The 7th is just boogie. 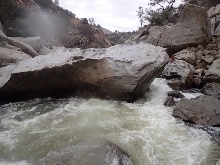 This one is a little blind but it goes left to right amongst large boulders. Slalom (III to IV). 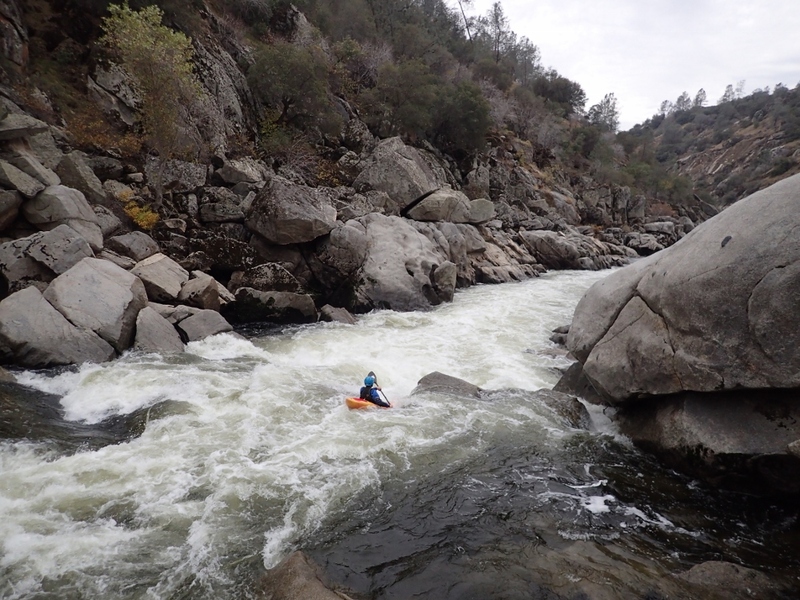 The last 100 yards of the river is a nice rapid with plenty of small holes to avoid and plenty of lines to choose from. 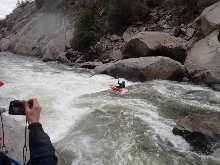 The first day we took out below the entire rapid at the inflow channel. The second day we stopped half way as to not have to backtrack to hike out. Take-out: Find your way to the town of Auberry 40 or so minutes north east from Fresno. Once in town, take Powerhouse Rd towards New Auberry. After 1.8 miles, turn left on Smalley Rd. Follow this for 5.3 miles down to the new powerhouse where the road ends. Put-in: For the full Patterson Bend run, see that write-up. 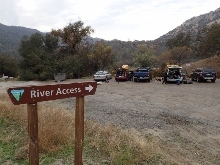 For the Squaw Leap put-in, head back up Smalley Rd for 1.0 miles. Just past the campground turn left at the first junction you have come to since leaving take-out. There is a parking area 100 feet later on your right. Park here and then hike further down the road another 300 ft and turn left at a gated road. A short ways later there is a fork, take the left fork down to the powerhouse. 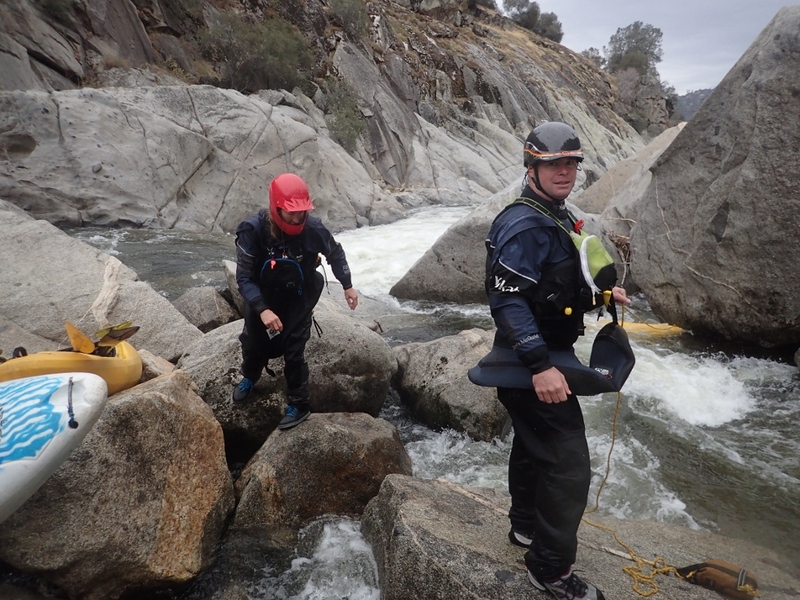 Scramble down the last 50 feet to the river. The total hike is 0.6 miles.